Once it deploys, the James Webb Space Telescope (JWST) will be the most powerful and technically complex space telescope ever deployed. Using its powerful suite of infrared-optimized instruments, this telescope will be able to study the earliest stars and galaxies in the Universe, extra-solar planets around nearby stars, and the planets, moons and asteroids of our Solar System. Unfortunately, due to its complexity and the need for more testing, the launch of the JWST has been subject to multiple delays. 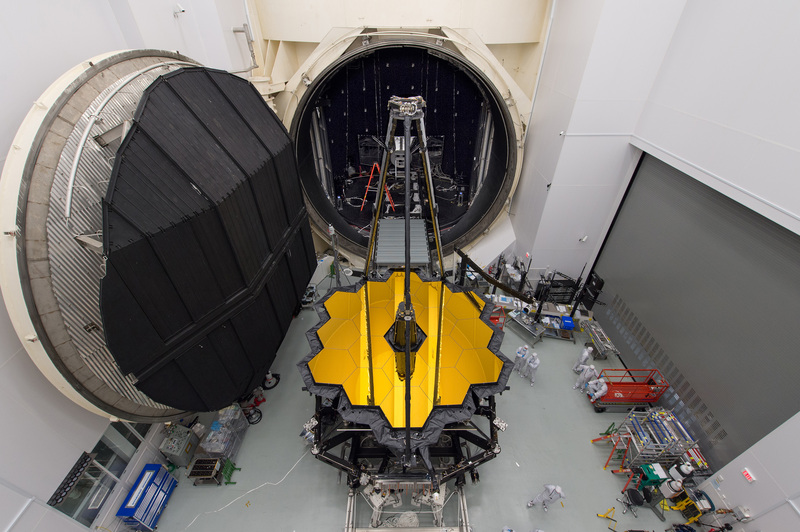 And as of this morning, NASA announced that the launch JWST has been delayed yet again. According to a statement issued by the agency, the launch window for the JWST is now targeted for sometime around May 2020. The decision came after an independent assessment by the project's Standing Review Board (SRB) of the remaining tasks, all of which are part of the final stage of integration and testing before the JWST launches. These tasks consist of integrating the combined optics and science instruments onto the spacecraft element, then testing them to ensure that they will deploy properly and work once they are in space. This assessment came on the heels of a report issued by the Government Accountability Office (GAO) in February that expressed concerns over further delays and cost overruns. These concerns were based on the fact that it is typically in the final phase when problems are found and schedules revised, and that only 1.5 months of schedule reserved remained (at the time) until the end of the telescope's launch window – which was scheduled for 2019. "Webb is the highest priority project for the agency's Science Mission Directorate, and the largest international space science project in US history." "All the observatory's flight hardware is now complete, however, the issues brought to light with the spacecraft element are prompting us to take the necessary steps to refocus our efforts on the completion of this ambitious and complex observatory." NASA also announced that it is establishing an external Independent Review Board (IRB) chaired by Thomas Young – a highly-respected NASA and industry veteran who has a long history of chairing advisory committees and analyzing organizational and technical issues. The IRB findings, along with the SRB data, will be considered by NASA to set a more specific launch date, and will be presented to Congress this summer. In the meantime, NASA and the European Space Agency (ESA) will be setting a new launch readiness date for the Ariane 5 rocket that will bring the JWST into space. Once a launch date is set, NASA will also be providing a cost estimate that may exceed the $8 billion budget cap established by Congress in 2011. This too is in keeping with the GAO's report, which predicted cost overruns. For those who have been following the JWST's development, this news should come as no surprise. Due to its complexity and the need for extensive testing, the launch of the JWST has been delayed several times in recent years. In addition, the final phase consists of some of the most challenging work, where the 6.5-meter telescope and science payload element are being joined with the spacecraft element to complete the observatory. In addition, the science team also needs to ensure that the observatory can be folded up to fit inside the Ariane 5 rocket that will launch it into space. They also need to ensure that it will unfold again once it reaches space, deploying its sunshield, mirrors and primary mirror. Beyond that, there are also the technical challenges of building a complex observatory that was created here on Earth, but designed to operate in space. Not only does all of this represent a very technically-challenging feet, it is the first time that any space telescope has had to perform it. Already, the JWST has completed an extensive range of tests to ensure that it will reach its orbit roughly 1.6 million km (1 million miles) from Earth. And while delays can be discouraging, they also increase the likelihood of mission success. "Considering the investment NASA and our international partners have made, we want to proceed systematically through these last tests, with the additional time necessary, to be ready for a May 2020 launch." The next step in testing will take several months, and will consist of the spacecraft element undergoing tests to simulate the vibrational, acoustic and thermal environments it will experience during its launch and operations. Once complete, the project engineers will integrate and test the fully assembled observatory and verify that all its components work together properly. And then (fingers crossed!) this ambitious telescope will finally be ready to take to space and start collecting light. In so doing, scientists from all around the world hope to shed new light on some of the most fundamental questions of science – namely, how did the Universe evolve, is their life in our Solar System beyond Earth, are their habitable worlds beyond our Solar System, and are there other civilizations out there?